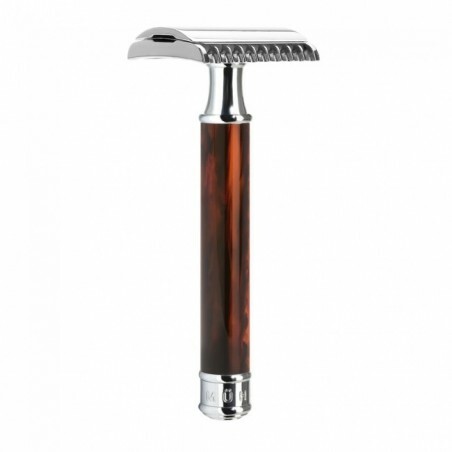 Mühle Double Edge Safety Razor R103 Open Comb Tortoise Shell. Mühle safety razors handles are made of high grade resin. High grade resin is a high quality synthetic material, the surface of which is processed and refined separately. The aesthetic basic shape of each handle is turned out of solid rots. Each individual work piece is polished in several passes to give the surface its special gleam. 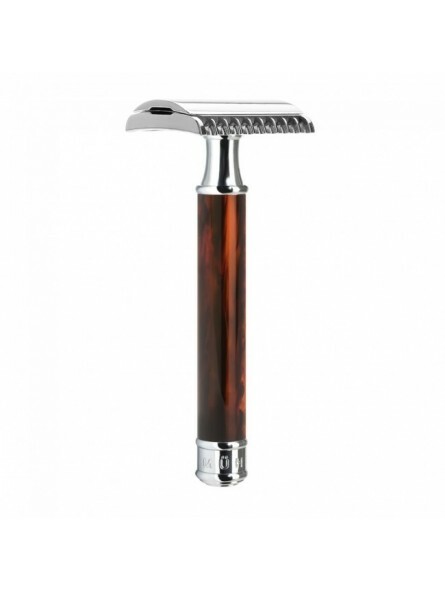 The result is a quality and long lasting safety razor. The razor head of R103 safety razor is an open comb. It’s thought and developed specially for experience wet shavers. Due to the principle of its construction, which features a special blade angle, it allows a closer due to greater blade exposure. As on safety razors with closed combs, the curved blade is exposed and clamped in place by the curvature of the cap. The open tooth comb and a gap behind the foam edge ensure that stubble and foam are transported away during the shave. This means that the edge is kept free of residues. All in all an innovative design which also makes subsequent cleaning easier. Open comb safety razors are recommended to men with dense and/or strong beard.